DETROIT — Two third-quarter touchdowns left the Packers within striking distance of the Lions, 20-14, heading into the fourth quarter of Thursday’s game at Ford Field. The Lions opened the second half with a 66-yard field goal drive, extending their lead to 20-0 with 8:54 to play in the third quarter. Green Bay followed with a drive that featured rookie John Crockett at running back. Crockett was signed to the active roster on Thursday following the release of Alonzo Harris. Eddie Lacy’s playing time continued to be limited. A screen pass to James Starks carried 25 yards to the Lions 8. On the next play, Starks fumbled forward into the end zone, where the ball was recovered by Randall Cobb for a touchdown. 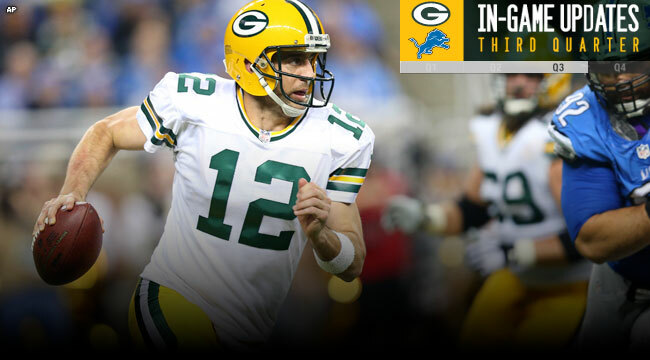 The Packers cut the Lions’ lead to 20-7, 5:44 to play in the third quarter. The Packers got the ball back on the next play from scrimmage, when Julius Peppers rushed from Matt Stafford’s blind side and swatted the ball out of Stafford’s right hand. Jake Ryan recovered the loose ball at the Lions 12-yard line. On third-and-6, Aaron Rodgers threw an 8-yard touchdown pass to Davante Adams that cut the Lions’ lead to 20-14 with 4:06 to play.